In our rapidly changing healthcare system, the line between doctors and nurses continues to blur. As nurse practitioners (NPs) play a larger role in delivering patient care, the day-to-day responsibilities of doctors and NPs are beginning to look increasingly similar. For students who are thinking about a career in healthcare, the question of which path to take — nurse practitioner or doctor — can be confusing. To clear up some of the confusion, here is an outline that provides some helpful information. You will learn what doctors and nurse practitioners do, along with some key differences and some reasons you might consider one path over the other. Doctors, or physicians, diagnose and treat injuries and illnesses. They examine patients; take medical histories; prescribe medications; and order, perform and interpret diagnostic tests. Education requirements: Four years of undergraduate education, four years of medical school and 3-7 years of residency. Average salary: Primary care physicians earn a median salary of $251,578, according to the Bureau of Labor Statistics (BLS). Nurse practitioners (NPs), also called advanced practice registered nurses (APRNs), serve as primary and specialty care providers. They perform exams, take medical histories, perform and order tests, diagnose patients, create patient care plans, provide medications, and consult with doctors or other professionals as needed. Education requirements: Four years of undergraduate study, a period of work experience, 2-4 years of additional schooling. Average salary: Nurse practitioners earn a median salary of $100,910 (BLS). Both careers focus on caring for patients, including both treating illnesses and providing preventative care. Both careers involve many of the same day-to-day responsibilities, including examining patients, taking medical histories, performing and ordering tests, prescribing medications and referring to specialists as needed. In both careers, a large portion of professionals work in primary care, delivering generalized care and serving as a patient’s initial touch point within the healthcare system. A smaller portion works in a specialization, such as obstetrics or mental health. Both careers take place in similar settings: about half of doctors and NPs work in physicians’ offices; followed by a third in hospitals; then smaller numbers in academia, community organizations or other settings. In the 23 states that allow NPs full practice authority, both doctors and NPs are allowed to open their own practice. The education requirements for doctors are much greater. Doctors must complete four years of undergraduate education, followed by four years of medical school and 3-7 years of residency, depending on their specialization. Nurse practitioners complete four years of undergraduate study, generally work for several years, then complete 2-4 years of additional schooling for their DNP degrees. While salaries are higher for doctors, they often graduate from medical school with significant debt. They earn much smaller salaries during residency, and spend several extra years in school not earning money. Nurse practitioners usually enter the workplace faster, earn high salaries, and can often expect their salaries to increase with years of experience. In the remaining 27 states that don’t allow NPs full practice authority, nurse practitioners are still required to work under the supervision of a doctor. Nurse practitioner careers are growing at a faster rate than the demand for doctors. The BLS projects that jobs for NPs or similar positions will increase by 36 percent from 2016 to 2026, as opposed to the 14 percent growth expected for doctors. The healthcare system is currently facing a major crisis involving a shortage of primary care physicians. As a wave of aging baby boomers begins to require greater levels of care, there simply aren’t enough physicians to meet the demand. A March 2017 study by the Association of American Medical Colleges estimated there could be a shortage of over 100,000 physicians by 2030, or about 43,000 primary care physicians. In that same period, the number of U.S. residents aged 65 and older is expected to increase by 55 percent. The number of people aged 75 and older is projected to grow by 73 percent. It’s clear that something must change if we are to meet our population’s healthcare needs. Even if more people embark on the path to becoming doctors, they wouldn’t enter the workforce soon enough to alleviate today’s pressing needs because of the 11-15 years of education required to become a physician. Experts say the practical solution is to move toward a system that allows nurse practitioners to provide more of our nation’s primary care. Nurse practitioners are already performing most of the same day-to-day duties as primary care doctors. And now, recognizing their potential to fill this healthcare gap, the system is changing to allow NPs to practice independently without requiring a doctor’s supervision. As of August 2017, 23 states have granted full practice authority to nurse practitioners, meaning they can open their own clinics without a doctor’s oversight. Regulations are in the works for many more states to allow full practice authority. Since today’s nurses require only two to three years of additional training to become nurse practitioners, they can enter the workforce much more quickly and start making an impact in the immediate future. And once they enter the workforce, they likely will have plentiful opportunities in the job market. Thanks to the pressing demand of our nation’s healthcare system, nurse practitioner jobs are projected to increase by 36 percent, or 56,000 jobs, by 2026. 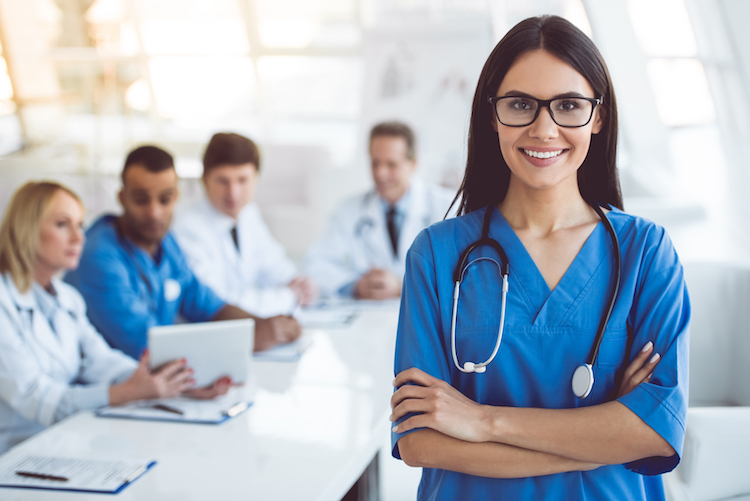 Students who are interested in pursuing healthcare careers, and are eager to make an impact where they’re needed most, may want to consider a nurse practitioner career. Most people pursue healthcare careers because they want to help people, despite the challenges involved. Right now, nurse practitioners have the opportunity to help in a fundamental way. They can have an immediate impact by making a difference in their patients’ lives, and they can affect the healthcare system on a macro level by helping meet our nation’s growing healthcare needs. If making a difference as a nurse practitioner sounds appealing to you, take a look at Maryville University’s Online Doctor of Nursing Practice program. Maryville’s DNP program with a nurse practitioner concentration offers a direct route to the nurse practitioner careers that are both rewarding and urgently needed. Now that you have a greater understanding of the nurse practitioner versus doctor debate, find out more about what a DNP program involves.